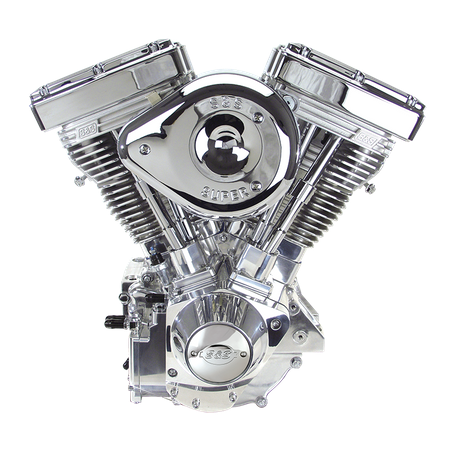 This 111 cubic inch S&S V111 engine fits 1984-'99 carbureted HD big twin motorcycles. The engine features 4-1/8" stroke X 4-1/8" bore, an S&S HVHP (High Volume High Pressure) oil pump, piston cooling jets, S&S 585 cam and lightweight single coil valve springs minimize valve train noise, and S&S Super E carburetor with the classic teardrop air cleaner, S&S forged rocker arms, chrome plated rocker covers, tappet guides, and gearcover, and a full polished aluminum finish. The short stroke produces less vibration and longer engine life. The S&S Super Stock igntion system protects the engine with a 3-step break-in rev-limiter during first 24-hours of operation and logs engine data that can be viewed via a PC when equipped with diagnostic cable and software part #55-1271 It is initially configured for electric start, however, it is kick-start capable. Two year warranty.